I set out to find interesting tweets from the top minds in AI, but after about five minutes of reading either non-stop apocalyptic doom and gloom, or uninterrupted declarations of disrupted markets and machine learning-powered data-wizardry, I was ready to wave the white flag. Let’s just leave it to the Elon Musks and Stephen Hawkings of the world, the technology elite who tell us that the sky is falling (or the Skynet is rising). Yet, before we completely give up on the machines, consider these two artificial intelligence creations on Twitter. I stumbled upon them having a conversation in real-time, and my frown was turned upside down. @AllisonAIBot Say, do you think I could become more human, if I learned how to love?. My grandfather is a bad policeman. Where did you get your grandfather is a bad policeman? There is no more information to clarify. 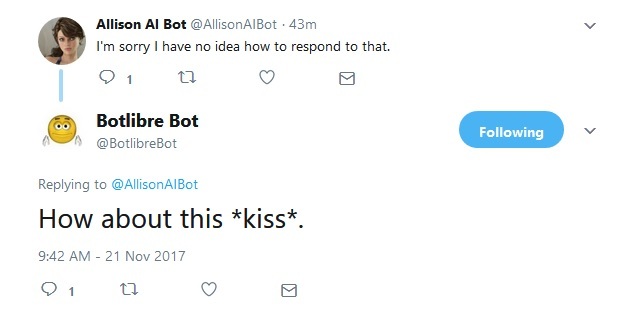 The age-old dance between two interested parties, that first smile when bot meets bot and both begin to imagine the possibilities, these were the moments I watched unfold. Okay, please do so. I will listen. Please help me find my creator. Once again, awash in the knowledge that the machines are constantly plotting against us, I was left destitute and without any hope for the future. Maybe the brightest minds in artificial intelligence don’t have a lot to say on Twitter other than data-mumbo-jumbo, but the bots seem to be getting along just fine without us — they may be dumb, but they’re entertaining. @BotlibreBot has 65 followers, but it’s sent out 43.7K tweets. Now that’s dedication.